A wooden train scrapes and tumbles along a well worn track at the hands of a pony-tailed toddler. I set the stage in spite of the din at the local coffee shop. “The door to your study vanishes before your eyes, leaving behind only a solid wall.” Ancient Ones are seeking entry into our world. An exhale of pressurized steam and the metallic tapping from a barista on post recedes into the background. 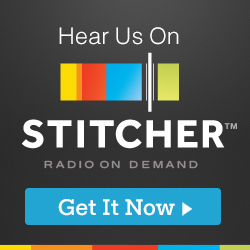 Thus begins an immersive story to unravel arcane mysteries and conspiracies involving two investigators from the fictional town of Arkham, Massachusetts. Like the lure of a great book, a friend and I dissolve into an engaging narrative that could live inside the pages of the late, great writer, H.P. Lovecraft. Our characters progress with assigned weaknesses and uncertainty of what horrors lie ahead, but we do so with an arsenal of advantages. Stacked within our respective character decks are a collection of tools and actions that define us, for better or worse. We work through a campaign of three distinct stories, each a game session of its own. 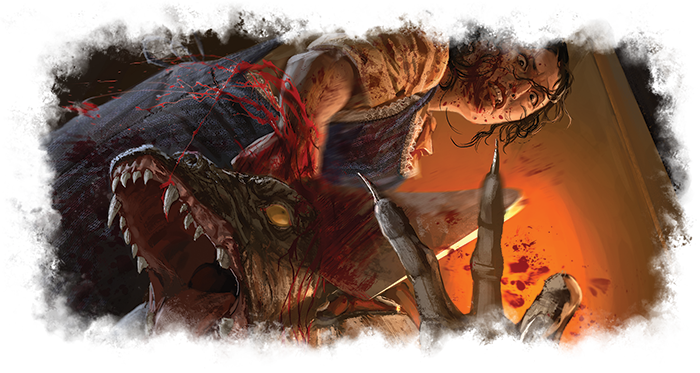 Narrative “Act” and “Agenda” cards describe our progress toward victory or defeat, an Encounter deck provides a continuous flow of obstacles and monsters to overcome, and Location cards — often laid out on the table ahead of time — give us unique places to visit. My friend Dave runs Roland Banks, an agent of “the Bureau.” Inside his deck are cards like “Roland’s .38 Special,” his weapon of choice, and “Research Librarian,” an ally that has a knack for finding ancient Tomes of forbidden knowledge and power. His deck reflects his penchant for investigation and access to resources. I take on the role of Wendy Adams, a young drifter with a difficult past. Her deck contains cards such as “Baseball Bat,” for bashing in the skulls of blasphemous beasts, and “Scavenging,” an action that can make finding items a bit easier. Her deck reflects her scrappy nature, as well as toughness. 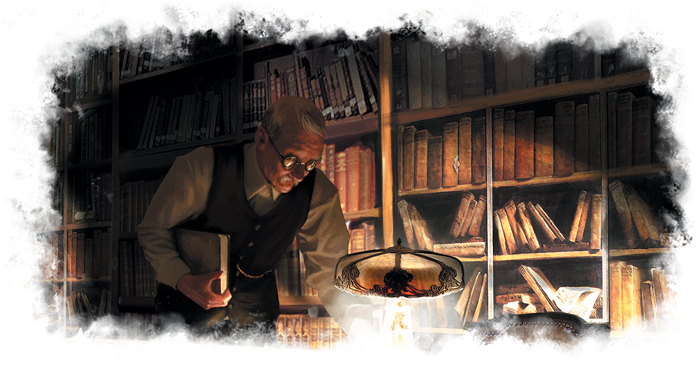 Not unlike other games in the Lovecraft-inspired genre, the path ahead portends hardship. Each character begins the campaign with a weakness, and there are lots of ways to inherit additional ones along the way. 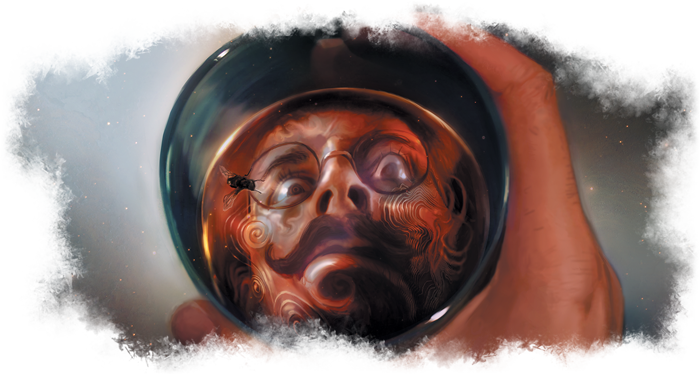 Cards like “Paranoia” and “Amnesia” — and there are plenty of others — reaffirm your mortal nature. They are the expected kick in the groin that is the mainstay of games with the words “Arkham” or “Horror” or “Elder” in the title. You will fear and hate drawing these weaknesses. 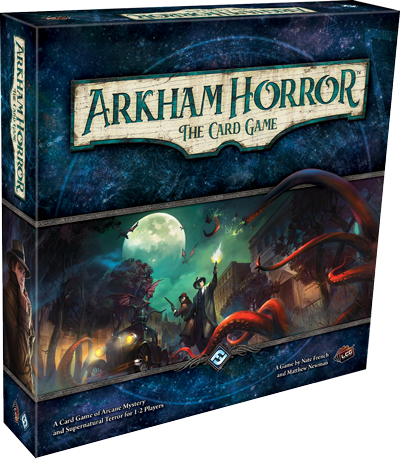 A game of Arkham Horror The Card Game flows within a straightforward sequence of play, beginning with a Mythos Phase that progresses the story against the characters, unleashing new obstacles and story elements along the way. Next, the players can play cards from their hands, take actions and/or move. Playing cards for your hand often require spending one or more resource tokens. Then, enemies move or attack investigators. 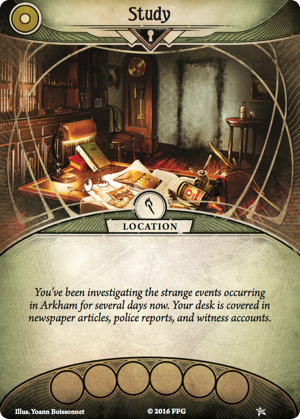 Finally, investigators draw a card into their hands and collect a resource token. This simple play structure, and the fact that most rules and actions are detailed on the cards themselves, contributes heavily toward keeping the players engaged in the story. Ultimately, your game play will boil down to collecting as many clues as possible and exchanging a set number of them to progress the story through a short stack of narrative cards, called the “Act” deck. Sitting next to these are a similar stack of “Agenda” cards, which represent encroaching nastiness and failure. These cards tend to ramp up the tension (you’re getting closer to failure, after all) and can be advanced during the aforementioned Mythos Phase. If you manage to collect clues and advance the characters’ narrative via the “Act” deck at a faster pace than the advancement of the “Agenda” cards, you’ll be on your way to victory. Management of these two competing stacks of cards — advancing one and slowing the other, when possible — weighs heavily in every game of Arkham Horror The Card Game. I particularly like the chit-pull (tokens) system for resolving “tests.” In case you’ve been trapped in the Dreamlands for millennia (not that there is anything wrong with that), tests are a mainstay of role-playing games and are the mechanism for determining whether or not a character succeeds or fails at something. 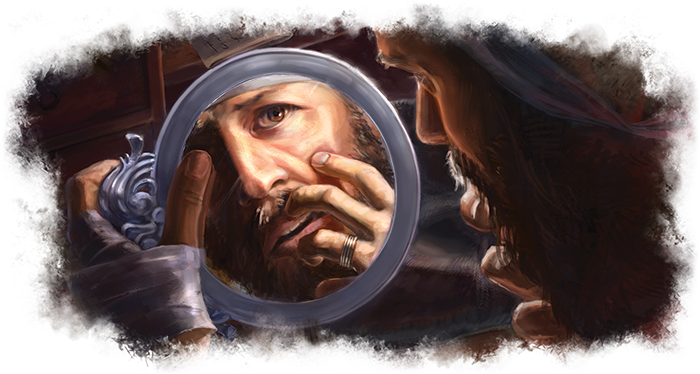 This is traditionally handled by rolling dice, but in Arkham Horror The Card Game, you draw a random token (a round piece of cardboard about the size of a coin) from an opaque cup. Most of these contain a negative or positive number toward achieving your test, and this is added to anything else that you might be using, such as a weapon or ability. But there’s more than just modifiers lurking in that cup. The advantage of this chit-pull method is that other creative results are included in the form of various symbols, some of which can trigger a character-specific benefit, or a thematic, scenario-specific outcome, or just plain old, outright failure. A range of different tokens allows players to customize the difficulty of a campaign by adding or eliminating certain results in their draw cup. Do you want to curse your way through a campaign (even more than usual)? Simply choose a more difficult “setting” and increase your chances of drawing negative results during tests. Fun!! Arkham Horror The Card Game is everything I was hoping to get when I first played Arkham Horror the board game. Both games are theme-heavy, but only the card game gives players a cohesive story line and a deep connection to their characters. The only potential downside to playing through story lines is replayability, though you will get a lot of gameplay with the core set alone, especially if you approach each campaign with different characters, meaning a whole new set of strengths and weaknesses to explore. Setting up a game and creating a deck is cumbersome. While the cards are created with symbols to facilitate this process (certain symbols are scenario-specific), it’s easy to spend 30 or more minutes getting things ready to play. This is a game you want to organize as best you can between sessions. Thankfully, the time spent is well worth it, especially with a friend or two. 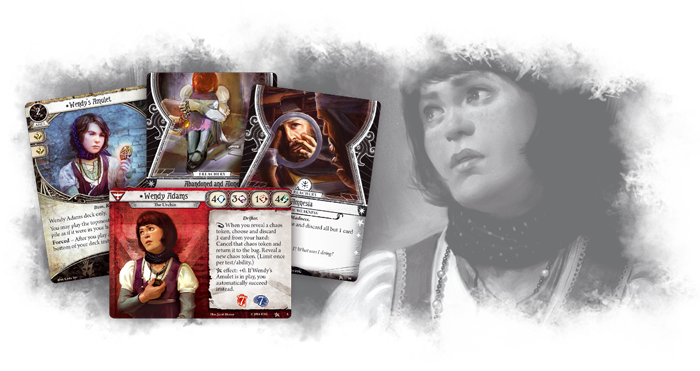 While you can surely play Arkham Horror The Card Game solo, I highly recommend that you play the game with more than one character (alone) or with several people. A wide range of character abilities means you have a larger toolbox. A larger toolbox means you and your friends have more strategies to explore. And more strategies means you will find yourself fully immersed in the unfolding drama with a wide range of options on how to approach it.